Raccoons Rags: Starting the Jedi outfit for 17" Tonner guys. Today I have mostly been making Jedi undergarments. Well, it seemed a good place to start. I've drafted up a pattern for the robe, but realised that there are several layers involved and each needs to fit over the other. There are different combinations of colour and shape around the net on cosplay sites, but I went straight to Obi Wan's particular raiment. Mostly because I have the Padawan action figure and his costume is pretty good. I picked the costume from Attack of the Clones, purely because I liked it. It's not an attempt to make it perfectly accurate, but I wanted to do the research. Not purely because of the McGregor goodness, but also I happen to like Star Wars. My Padawan is swathed in cheesecloth, and on looking up some good pics from the movies, that's what Mr McGregor seems to be wrapped in, so that's what I wanted to use. It's hard to find in the UK, bizarrely, but I found a store in the USA that does lots of different colours, so I treated myself to yards of the stuff for future projects. 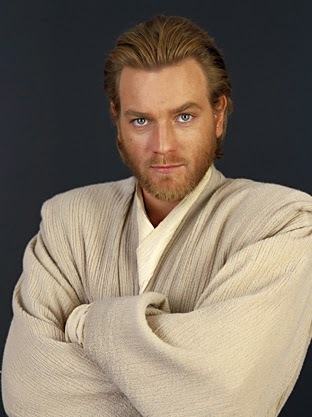 EWAN MCGREGOR: MAKING HUMBLE CHEESECLOTH LOOK SMEXY. Okay, so the first layer looks like some kind of wrap-over shirt. You can see at the neck in the pic below. 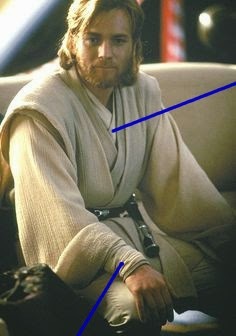 The cuffs seem to swathe his wrists like a kind of wrap. The sleeves of this underthingie are tight around his arms. It's hard to do very tight sleeves on a doll when the fabric is not stretch, but I've gone for something fitted as well as possible, even though the hands will have to be popped off to dress him. I've devised a wrap-fronted shirt, with cuffs that simulate the wrapped effect a bit, and this first bit of clothing will be in the form of a leotard, so I can pull up his trousers over it and it will sit right. Next, I'll make the longer, wide-sleeved jerkin, and then the strange garment that comes down over his shoulders and belts up. It's not quite a waistcoat, but I'll work it out. There will be pics as I go along. I know! It's so annoying, even if you search for it under crinkle cotton etc, it seems very scarce.